It was a week of two halves. The first was all festive glitter, mulled wine and the most amazing macaroons at a chi chi Christmas lights on party for this London shopping arcade. The second saw me travel cattle class to the depths of North England for work. The 3-hour train journey I can handle. Being rudely awoken by drunk girls while I’m asleep on six-inch, deep filled mattress in a boutique hotel I can deal with. But failing to find something decent for lunch in a 60s-style shopping parade is where I give up. Convinced the only decent thing to do would be to get with the programme, my colleague dragged me off to a local chippie. Which evidently sustained the town’s entire school going population and had a lucrative sideline in Chinese specialties. Fancy a deep fried sausage with Singapore noodles? The stress of it made me crave curry. Anything with a hint of masala would do. I bought a chicken tikka wrap. Slices of pre-cooked chicken smothered in a ready made curry sauce and doused with raw onions. But I couldn’t stomach it. I’m not usually the tiffin box type but I wish I’d brought along kala channa, little black chick peas with an spicy masala coating. Low fat, high in protein and fibre, these are the just the thing for snacking, alongside a full Indian meal or when hopes are fading fast. A handful of this stuff on a bed of simple salad would have considerably lifted my spirits last week. Thankfully, I soon found a cafe that sold green tea and home made cake. 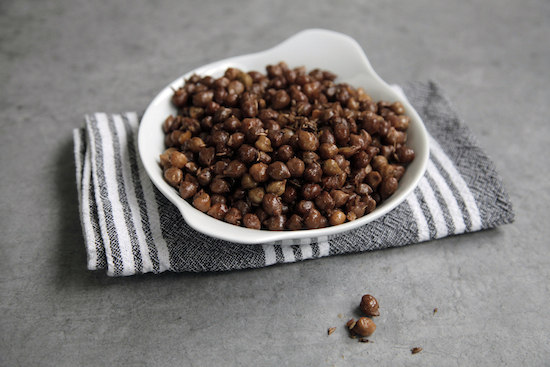 Soak the chick peas overnight or at least four hours in a large pan of cold water until they double up in size. Drain, refill with cold water and then boil on a high heat for 20 minutes until you can squish them really easily with your thumb and index finger. When it’s ready, drain and set aside. In another large pan, bring the oil to heat over a high flame. When it is hot, add in order the ginger, cumin seeds, ajwain seeds, chilli powder. Stir for a minute so that the ginger starts turning golden. Now add the drained chickpeas, the salt and fry stirring vigorously on the high heat for about five minutes until the masala evenly coats them. Eat hot with your meal, or cold straight out the fridge as a healthy snack. Or take in a tiffin box where food may not meet your exacting standards. Somewhat like Tamilian Sundal, I love the taste of Black chana! I don’t you will alreadt soaked Chana though.I soak the whole pack, cook them in pressure cooker with water, divide into portions and freeze!! I HATE those “Hotel” nights when college kids walk in at midnight, drunk, loud and crass! UGH!!! They even argue and puke, we avoid all the beaches during Spring break here! This is a good snack in the party. I do it with slit green chilli,little red chilli poder,crushed rosted jeera seeds,crushed ajwain and little blacksalt powder with normal salt. Next time I will follow your dish,let me see. Mallika your website has helped me impress husband and in laws – which is quite a feat considering the only cookbook I own is called ‘The Foolproof Cookbook for Brides, Bachelors, and those who Hate to Cook’. Have you tried using canned kala channa for this? You need to wash them thoroughly or they smell vaguely chemically – but they are great! I haven’t soaked chana or rajma since I moved to England! Oh these look great. I have never seen black channa before but I will have another look. BTW, on another blog you said that you can’t get poha in London. I managed to find some in January when I was there, so if you email me I will look it up and maybe I can help you get hold of some. As usual briliant stuff written as well as cooked! I routinely check your blog. and follow it too. About poha, you can find it in that big asian store in southall , i cant remember its name but it is located bang opposite the Himalaya movie theatre, on the main road…you can get busses going towards in from the southall train station or you can walk it too i guess. This store has everything possible from india. I used to go there regularly when I lived in twickenham. Another store is named desi foods ,this is located at the end of the main road right outside the hounslow british rail station (i think richmond road) …again you can take bus going towards twickenham. I remember the directions only vaguely because it has been 2 yrs now! This store is also fantatsic!!!!! Literally erything indian, you get it here, including poha. Thanks ladies! I am off to the shops now to find canned kala channa and poha!! Rupanjana – your comemnt made me laugh. is there really a cookbook with that title?? I am writing a cookbook titled “The I can’t be bothered cookbook” – LOL. Wow, yes, please, i ll take a whole bowl. Nice snack. I make similar with soy beans instead. Just soak them overnight, pat dry and fry in spices. No need to parboil them. Tasted crunchy and great! I have not tasted. I will definately try this.